When we talk poker at Gambling Teachers, it follows that poker chips and tricks must be included in the conversation. This lesson at How to Play Poker details the business of poker chips and continues with the entertainment aspect--poker tricks. These colorful, unique chips have transcended the game and in turn set up a separate industry with poker tricks. Chips can vary in weight, shapes and sizes. The weight is standardized and there are three basic weights, 10 grams, 11.5 grams and 13 grams. Additionally, there are many variations depending on the manufacturer. The most popular types of poker chips are made of clay and plastic. Others on the market today are made of mahogany and oak plus the rarely seen--graphite chips. Most of the chips available are purchased in sets that range from 200 to 600 pieces, depending on how many players will be using them. Traditionally, a player will need 100 pieces. Thus, a 2-player game will need 200 to 300 chips. Therefore, a 400-chip set can be used by as many as four poker players. Many poker companies provide poker sets. 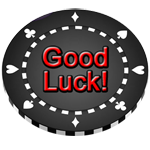 Most offer customized poker chips that can display a company logo, celebrity faces, numbers, flags and emblems. These examples are just a few of the possibilities in a custom set. The chips are often used for advertising products, while some of them are specifically designed by poker fans. Poker chips have become a lucrative business. There are rare poker pieces that are collector’s items. As it is a hobby whose fans are enthusiastic, there are also slick set cases. These are often made of aluminum, while some higher end examples are made of graphite. Other popular cases are made of carbon fiber, wood, vinyl and leather. Moreover, certain chips sound different. Expert poker players and/or poker tricks masters have their own preferences of chips. The best chips are those that have a sharp, crisp sound when they fall. These types of chips are the most common poker chips found in casinos worldwide. Moving to the entertainment arena of chips, there are poker chip tricks developed from long rigorous hours of playing poker. Poker enthusiasts have developed a method of killing waiting time and in the process developed a method to intimidate other poker players. You might have seen a player randomly rotate his stack of chips using a single hand. Some poker fanatics also employ magic coin tricks. Not only is watching these tricks entertaining, but it is also a very serious discipline. Learning these tricks takes hours to master. It should be noted that a serious poker player is different from a serious tricks master. Often, the poker fans are also the trick players, but poker tricks have surpassed the mere poker game. There are also trick tournaments in the US. Here are four examples of poker chip tricks with descriptions. 1) Finger Roll: for beginners, this back of the hand chip trick is the easiest to master. Roll that chip from your thumb to pinky in one practiced motion. However, more practice is required to roll back from the pinky to thumb, thus creating a cycle. 2) Chip Shuffle: two stacks of chips are shuffled like a deck of cards. As your skill level increases, move up to using more chips in each stack and shuffling faster. 3) Quick Flip: use your skill to flip the first chip in the stack to quickly becoming the last chip in the stack. 4) Chip Bounce: is the most difficult to master of the tricks listed here. Your goal is to bounce a chip off the felt and have it settle on a stack of chips. Anyone who has bounced a pool ball on a felt billiard table knows the difficulty involved. Additionally, a felt table is mandatory, as this trick will not execute properly on a hard surface. Poker is a very exciting and interesting game that had been with us for many, many years. I am certain that poker chips and tricks will remain a welcome branch of the poker world. Poker has a history dating back to the time of kings and queens, and until now, a royal flush was the best way to have all the chips at your side. The brief description is a 5-card draw version where the low hand wins. Straights and flushes count as high hands; therefore, the best possible hand is 2, 3, 4, 5, and 7. Each player receives five cards face down. After betting, a player is allowed to draw up to five new cards. Once a player receives their new cards and a final round of betting occurs, the low hand is declared a winner.